A new study of 209 galaxies in the early universe with X-ray bright supermassive black holes reveals that more modest active galactic nuclei (AGN) tend to peak later in cosmic history, and that obscured and unobscured AGN evolve in similar ways. Supermassive black holes containing millions or even billions of solar-masses of material are found at the nuclei of galaxies. Our Milky Way, for example, has a nucleus with a black hole with about four million solar masses of material. Around the black hole, according to theories, is a torus of dust and gas, and when material falls toward the black hole (a process called accretion) the inner edge of the disk can be heated to millions of degrees. Such accretion heating can power dramatic phenomena like bipolar jets of rapidly moving charged particles. Such actively accreting supermassive black holes in galaxies are called active galactic nuclei (AGN). The evolution of AGN in cosmic time provides a picture of their role in the formation and co-evolution of galaxies. Recently, for example, there has been some evidence that AGN with more modest luminosities and accretion rates (compared to the most dramatic cases) developed later in cosmic history (dubbed “downsizing”), although the reasons for and implications of this effect are debated. CfA astronomers Eleni Kalfontzou, Francesca Civano, Martin Elvis and Paul Green and a colleague have just published the largest study of X-ray selected AGN in the universe from the time when it was only 2.5 billion years old, with the most distant AGN in their sample dating from when the universe was about 1.2 billion years old. 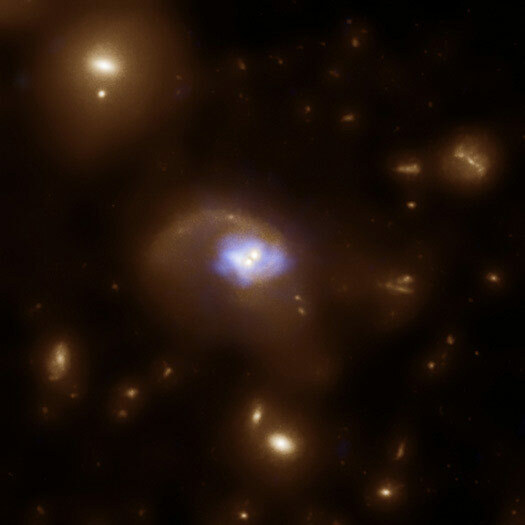 The astronomers studied 209 AGN detected with the Chandra X-ray Observatory. They note that the X-ray observations are less contaminated by host galaxy emission than optical surveys, and consequently that they span a wider, more representative range of physical conditions. The team’s analysis confirms the proposed trend towards downsizing, while it also can effectively rule out some alternative proposals. The scientists also find, among other things, that this sample of AGN represents nuclei with a wide range of molecular gas and dust extinction. Combined with the range of AGN dates, this result enables them to conclude that obscured and unobscured phases of AGN evolve in similar ways. 2 Comments on "Chandra Confirms Active Galactic Nuclei Downsizing"
Alright, fess up. Who is this “a colleague” person? check-out St JEROME PICTURE ‘WIKI HERMIT; for emergent life in the picture! for us to focus and view IN OUR DAILY LIVES !